The IS Academie Education and International Development/Governance of Inclusive Development (GID) organised a lunch lecture on “Smelling the blood on the floor: Critical reflections on what it means to be ‘ethical’ in sensitive research” by visiting scholar Jennifer O’Brien (University of Manchester). The presentation drew upon two years of ethnographic fieldwork in maternal child health in chronically poor rural Uganda to critically reflect upon the ethical quagmires of researching sensitive topics. 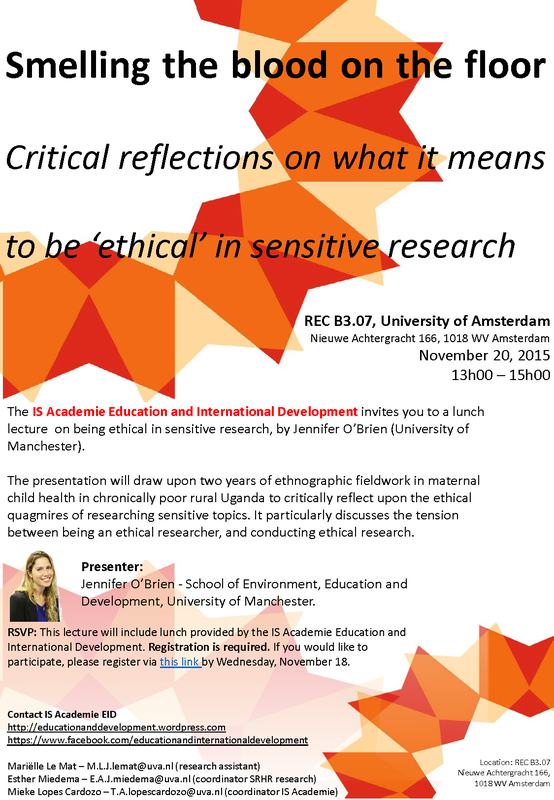 It particularly discussed the tension between being an ethical researcher, and conducting ethical research. Date and time: November 20, 2015 from 13.00-15.00. Registration: This lecture included lunch provided by the IS Academie Education and International Development/GID.